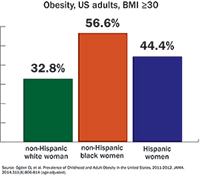 WASHINGTON, DC — Two large new studies provide compelling evidence that obesity increases the risk of the most common type of postmenopausal breast cancer among both African Americans and Hispanics. 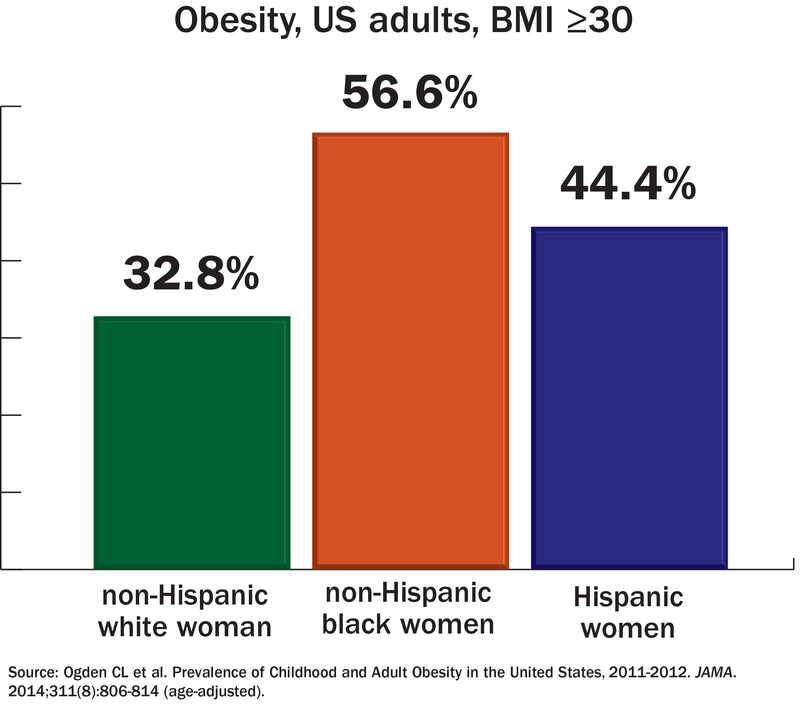 Over one of every two African American woman and almost one of every two Hispanic woman is obese. The study included 1,262 premenopausal (497 cases, 765 controls) and 2,023 postmenopausal (759 cases, 1,254 controls) Hispanic women pooled from two U.S. population-based case-control studies: the San Francisco Bay Area Breast Cancer Study and the 4-Corners Breast Cancer Study. “We saw that when Hispanic women became overweight or obese, it increased risk of ER and PR positive breast cancer in postmenopausal women. We’ve known this for a long time for white women, but now we are seeing this also in Hispanic women,” John said. The few previous studies investigating obesity’s link to breast cancer among US Hispanics have been small with inconsistent findings, says John. This large study fills in a lot of missing information about obesity and breast cancer in postmenopausal Hispanic women. The other study, by epidemiologist Elisa V. Bandera, MD, PhD, at the Rutgers Cancer Institute of New Jersey and her colleagues analyzed the associations of obesity with different hormone-receptor types among over 15,000 African American women, finding that excess weight is linked with a 31 percent increased of ER positive tumors in postmenopausal Black women. The study used case reports from the AMBER (African American Breast Cancer Epidemiology and Risk) Consortium, which combines data from four studies with a large number of African-American participants: the Black Women’s Health Study (BWHS), Multiethnic Cohort Study (MEC), Carolina Breast Cancer Study (CBCS) and Women’s Circle of Health Study (WCHS). Examining a total of 2,165 ER positive cases and 1,093 of the more aggressive ER negative cases (including 491 triple negative breast cancers) matched against 12,437 women without cancer, the study also showed that risk is higher for postmenopausal women who were lean as young adults and gained weight in adulthood, with almost double the risk of ER positive tumors. “We know that breast cancer has several subtypes and there is growing evidence that these subtypes have different risk factors. The distribution of these subtypes and risk factors are different for African Americans and Hispanics compared to white women,” Bandera said. Findings of a study on how obesity contributes to breast cancer in Mexican women, presented by the International Agency for Research on Cancer (IARC) in March 2010 as Head of the Section on Nutrition and Metabolism. 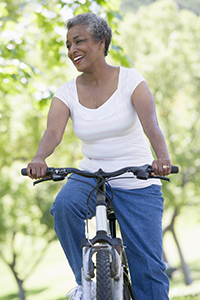 Findings on whether the association of BMI with breast cancer is stronger in women of Asian than white ancestry by Gertraud Maskarinec, MD, PhD, researcher at the University of Hawaii Cancer Center. Read more news about the conference at aicr.org. Esther M. John et al. Overall and abdominal adiposity and premenopausal breast cancer risk among Hispanic women: The Breast Cancer Health Disparities Study. Cancer Epidemiology, Biomarkers & Prevention. Published OnlineFirst October 28, 2014. Esther M. John et al. Body size throughout adult life influences postmenopausal breast cancer risk among Hispanic women: The Breast Cancer Health Disparities Study. Cancer Epidemiol Biomarkers Prev; Published OnlineFirst October 28, 2014.